That cheeky scamp Labrinth has got his new single on Radio 1's A-list, so you can be pretty sure it'll be inescapable over the next month. The lyrics are a Jessie J-style lecture about being who you want to be and don't let anyone tell you that who you are isn't good enough because we are all individuals and everyone has the right to determine their own path in life. YOU ARE BEAUTIFUL NO MATTER WHAT THEY SAY WORDS CAN'T BRING YOU DOWN. However, Labrinth's rules do not apply to murderers and despots, who should stop being who they want to be right now and be someone else instead. Express Yourself samples the 1960 funk classic of the same name by Charles Wright - but Labrinth doesn't quite do it justice. According to science, his version Express Yourself is only the sixth best Express Yourself of all time. The chart goes like this. 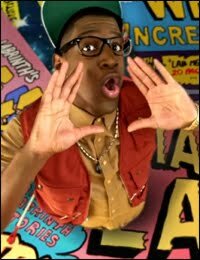 Labrinth's video is a lot of fun, though. Take a look below.